Years ago, I introduced Roger’s Law of New Product Introduction AKA The Fanboy Uncertainty Principle. But what about new releases that really aren’t new? Usually, they fail to reach sufficient quantum energy to generate much of an opinion either way. They are the dark matter of photography, detectable only by the size of B&H’s website. It has been my pattern, over the years, to slam any manufacturer that slaps a ‘II’ or ‘III’ on a product with no real changes except in the price. Sure, you changed the coatings or cosmetics, because you either changed suppliers or your manufacturing process. 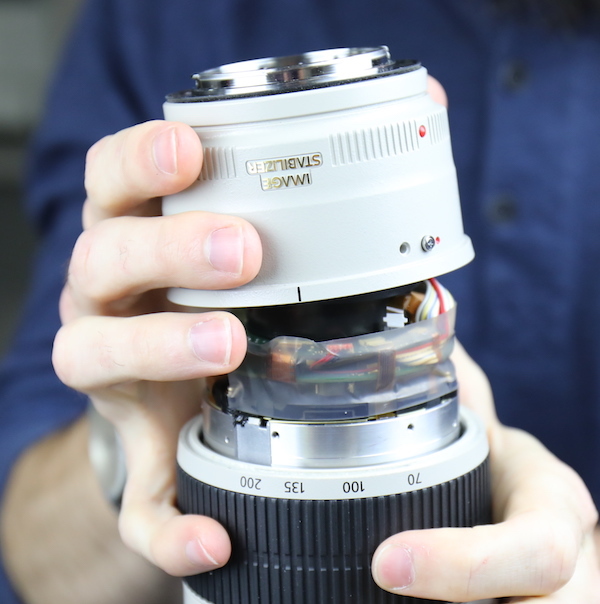 And now you want $300 more for the lens. So for this exercise, we did a full teardown on a Mark II, then repeated it on the Mark III. 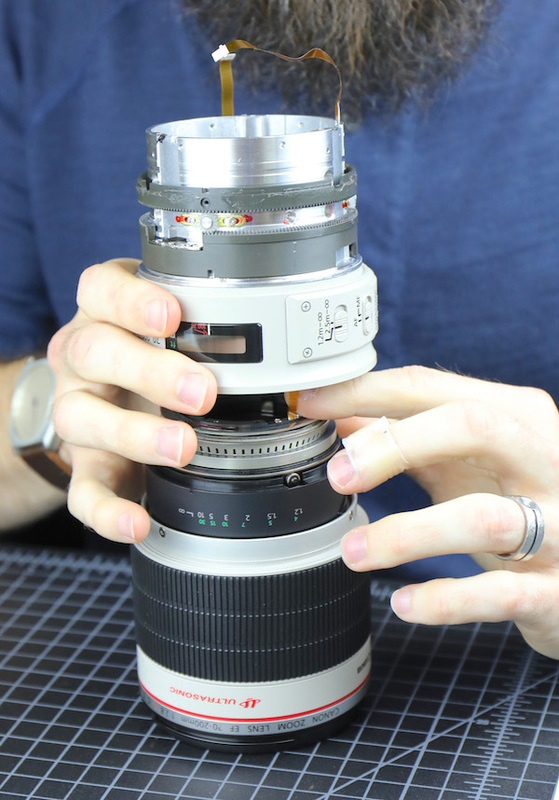 If you compare the 70-200mm f/2.8 Mk II to most other Canon lenses, the back (mount) end of the lens, well, it isn’t pretty. 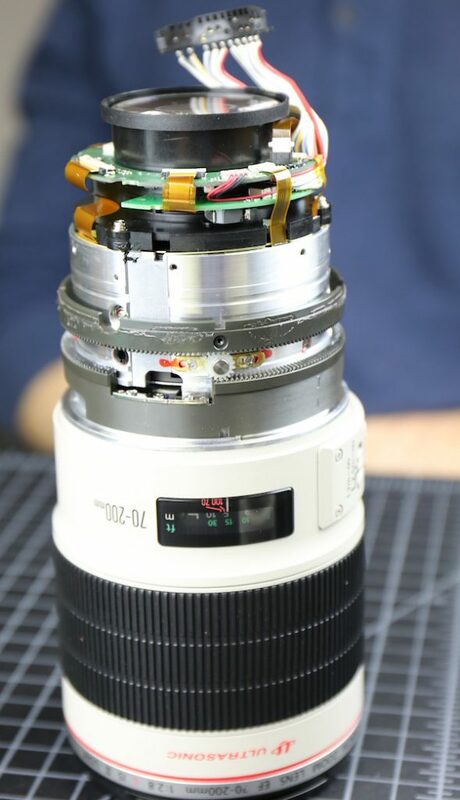 There are a lot of wires, a clumsy centering mechanism, shims, and all kinds of things that Canon has gotten away from in their other lenses. It works fine, but it’s crowded, complicated, and kind of a pain to work on. The one nice thing about disassembling the back end of the Mark II is the light baffle just pops right out. 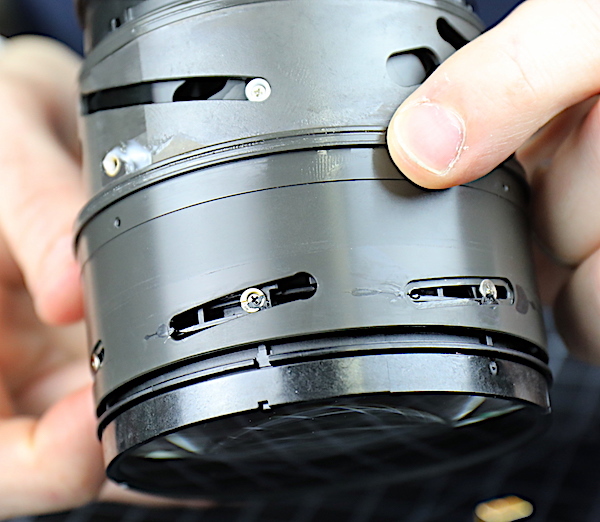 After removing the screws holding the electrical connection to the bayonet, you remove the 8 barrel screws to remove the rear outer barrel (these are the ones that come loose every so often, jamming your tripod ring). With those out, the rear barrel slides right off. 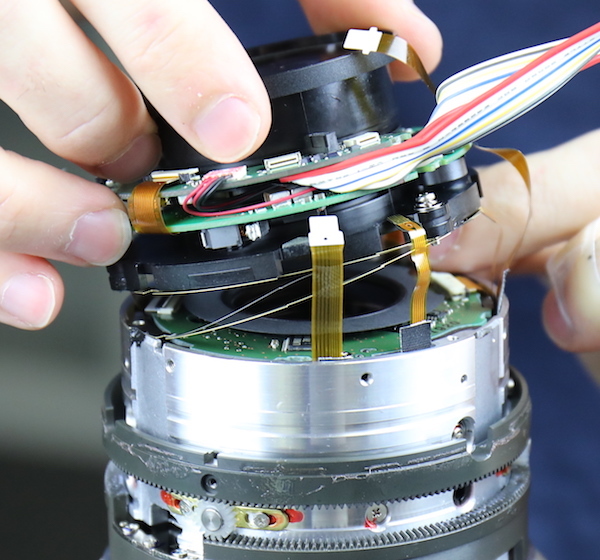 Revealing a very uncharacteristic (for Canon) wiring harness held in place by tape. Don’t mistake me; they’ve been doing it this way since the 70-200mm f/2.8 IS original version. It doesn’t cause problems, but nobody would call it elegant either. As an aside, while the rear barrel and bayonet are most easily removed as a single piece, it is actually a 3-piece assembly. There is a spacer (red arrow) between the bayonet and the barrel that comes in various thicknesses to adjust infinity focus. 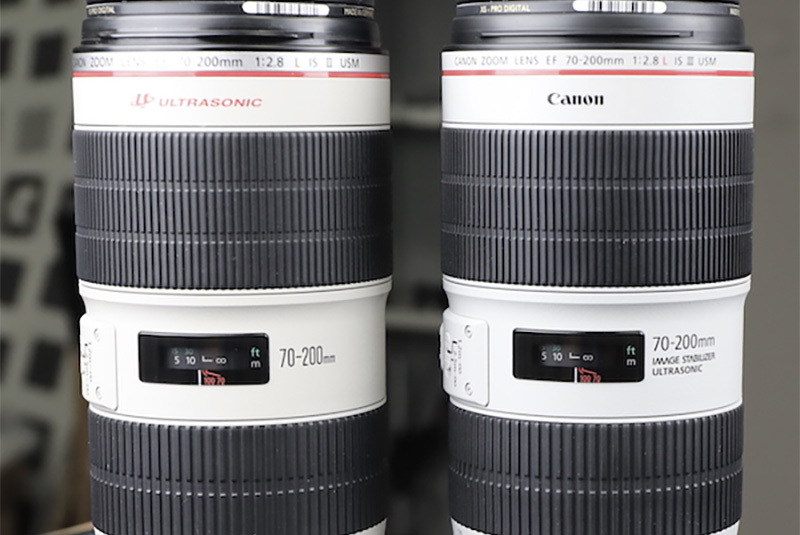 Let’s take a closer look at the tangled electronic complexity that is the Canon 70-200mm f/2.8 IS II rear end. The only thing that would make this better would be if that was duct tape around the back. Honestly, this tape works well and lasts forever. But if you ever find yourself in this position, just take it off very carefully. You can, I’ve heard, rip a flex in two if you aren’t careful. 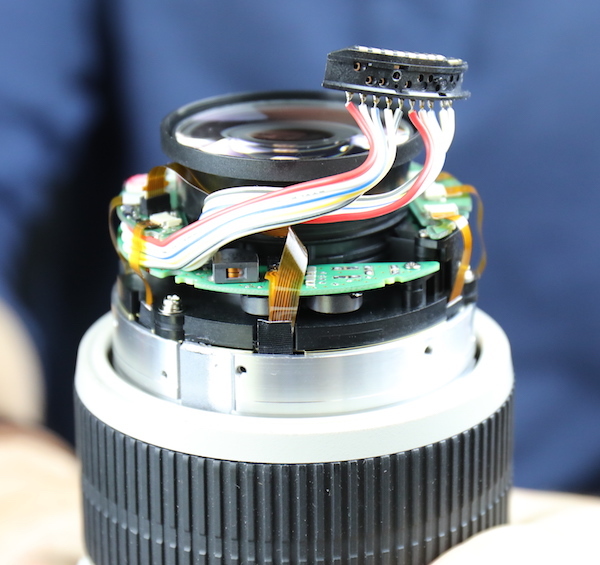 Once the tape is off, you can see the double circuit boards, multiple flexes, and wandering wires that make this lens not much fun to work on. 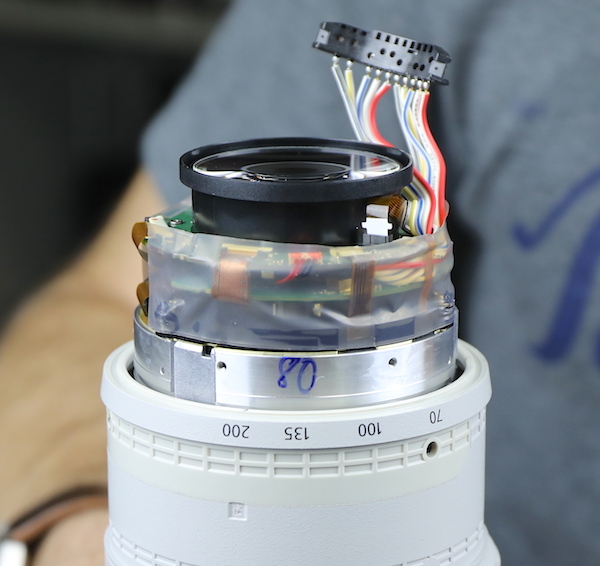 On the other side, we have a close up of one of the three ‘screws of the dark abyss’ that hold this rear assembly on to the rest of the lens (that’s it, sitting right above the 135 marker on the zoom barrel). Note to those of you who want to take your 70-200 f2.8 IS apart: once you remove those screws you are well and truly… going to have to do a lot of optical adjustments. But more on that later. Same mount and rear barrel that comes off the same way. Same wire harness and circuit boards underneath. We took the tape off and looked around, but rather than clogging up more bandwidth with pictures; it’s the same rear centering and spacing system as before; if you want to see the internal parts of the Mk III, just look at the Mk II pictures. Peeling away the zoom rubber shows the actual zoom barrel and the screws that hold it on to the actual zoom mechanism inside. This is one of the parts that have changed over time. 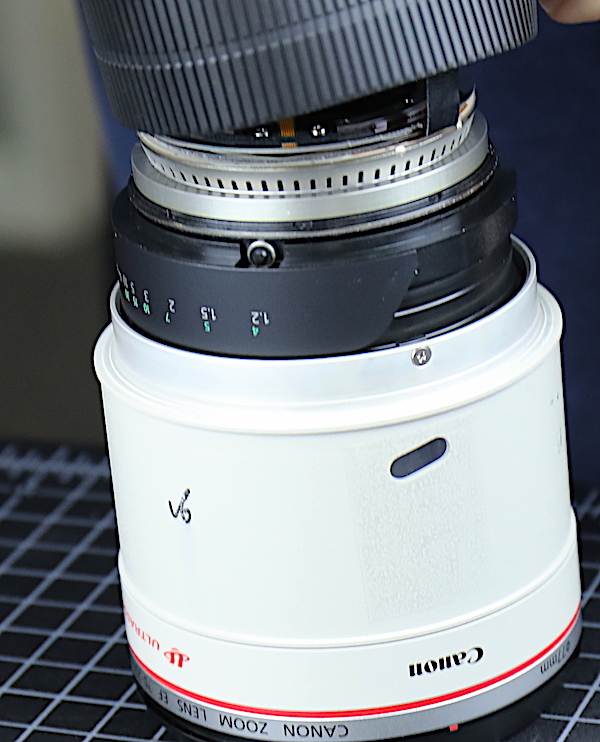 Early versions of this lens had a smooth zoom barrel, but later versions had the waffle-grip that newer Canon lenses have, like this one. Yes, we’ll wait while you peek under your zoom rubber to see which kind yours is. 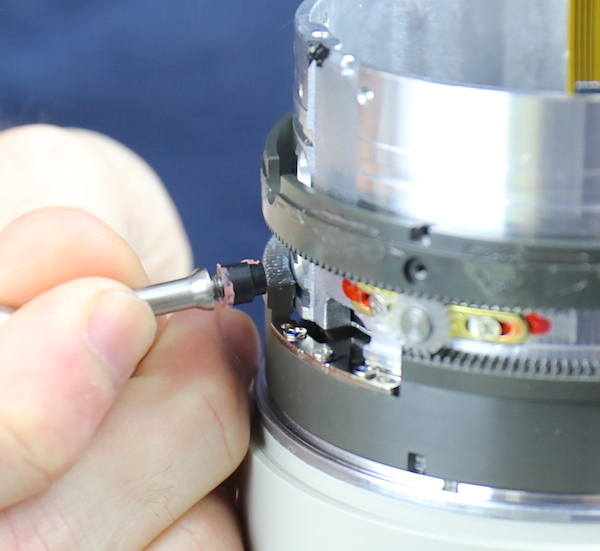 Removing those screws lets us slide the outer zoom barrel off, exposing the reverse gear mechanism. 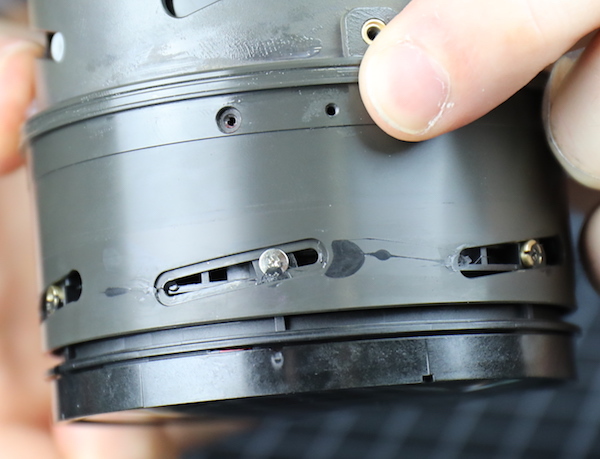 You can see the screw hole in the outer barrel directly above the screw hole in the black inner rotating ring. 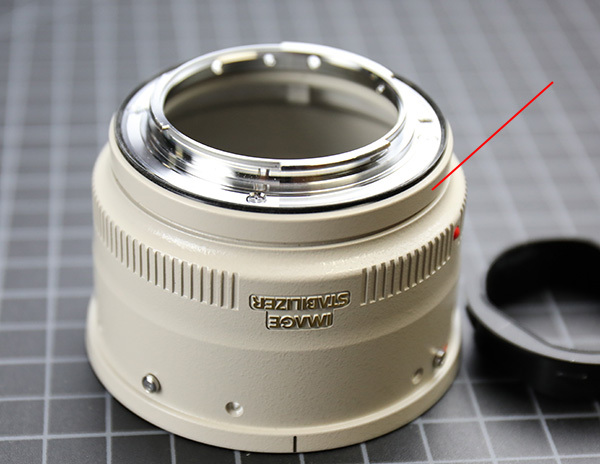 The reverse gears purpose is so when you turn the zoom ring in one direction; the actual zoom mechanism turns the other direction. ‘Cause, you know, why make something simple when you can add a bunch of gears and teeth? Actually, it does have a purpose. The reverse gears are adjustable and help keep the zoom motion smooth and with just the right amount of resistance. 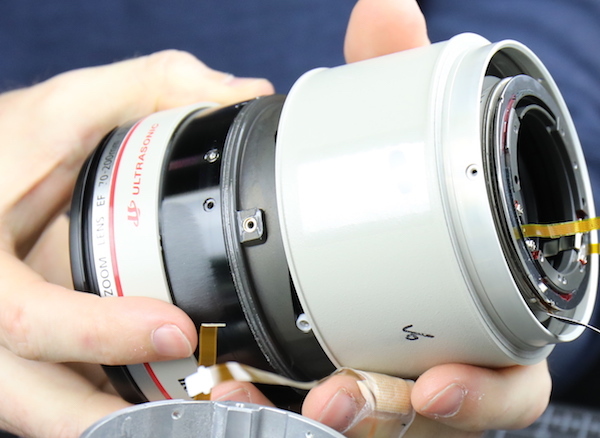 And let’s show a quick look at the Canon 70-200mm f/2.8 IS Mk II with the rear outer barrels removed before we start taking things apart. Again, the zoom barrel comes off the same way. The reverse gears, position brushes, and tension mechanisms are all the same. My real hope for a change in this lens was that we would see the eccentric optical adjustment collars would have incremental marks like the ones we saw in the Canon 70-200 f/4 IS Mk II, indicating some computer-aided optical adjustments. Alas, in this group at least, the eccentric collars were just as they have been, as are the roller bearings. 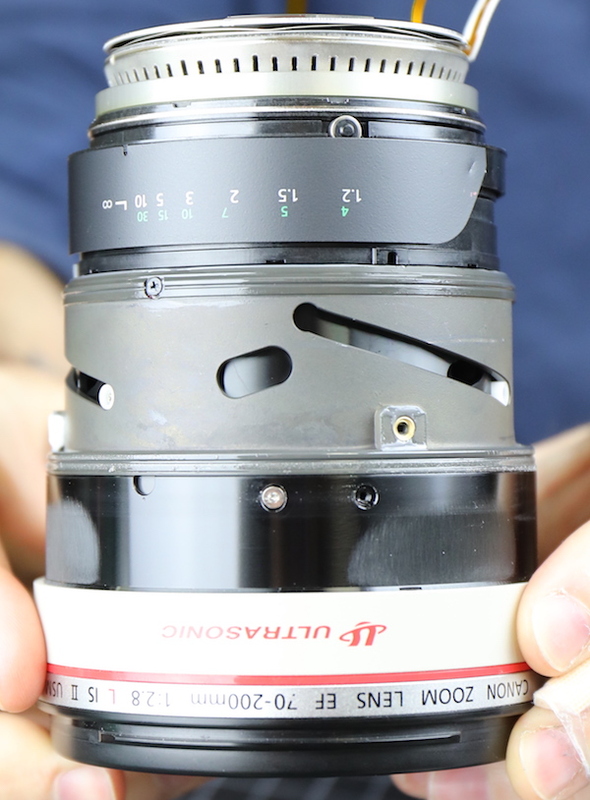 So it’s time to remove the screws of the dark abyss that hold the rear group onto the lens barrel. Once those are out, and the flexes carefully moved out of the way, the rear assembly comes right off. 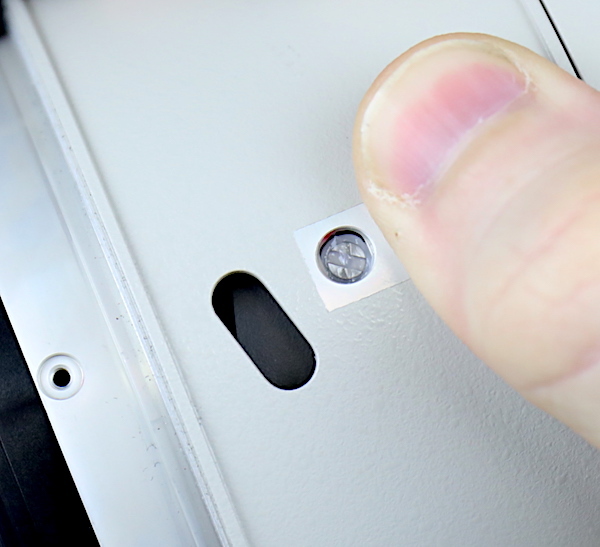 There are spacing shims underneath, usually two or three of various thicknesses. These are not infinity spacers but are of optical importance. The entire rear group is a centering element and a bit of a pain for us to adjust: we have to estimate the centering move, then reassemble and test and often disassemble and readjust. It’s not hard if you have the right equipment, but it is time-consuming. There’s a flex going into the IS unit that has to be disconnected before setting the rear group aside. But now we have a nice look at the top of the IS unit, along with its circuit board. The IS group is held in place with three, three-piece roller assemblies. 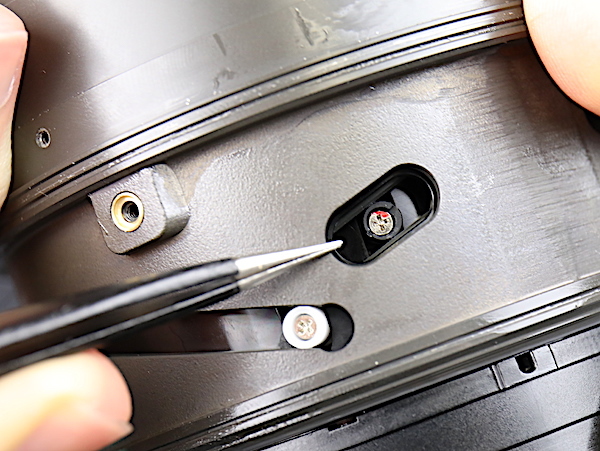 The screw is removed (see the opening centered below) but then a small extractor is needed to get out the roller and post. Below is one assembly together and the three pieces that make up another one, just above and out of the plane of focus. It’s a robust bit of hardware, but I assume IS units stress hardware a bit, so that seems like a good idea. Once those are removed, the IS unit slides out of the barrel. 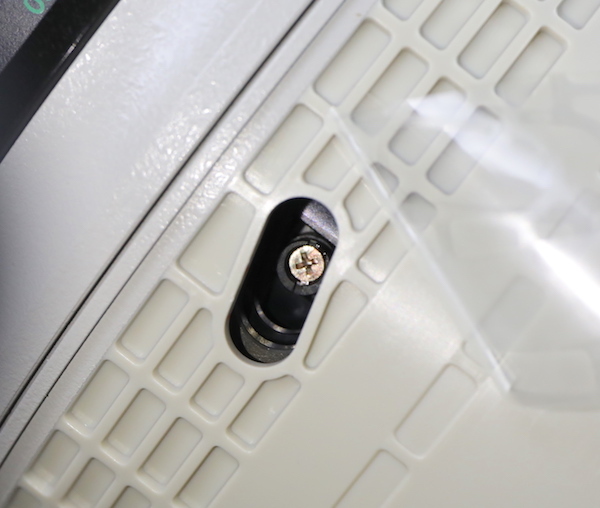 These are self-contained units that we generally don’t disassemble. Again, I won’t clog bandwidth. The internal components back here are the same. 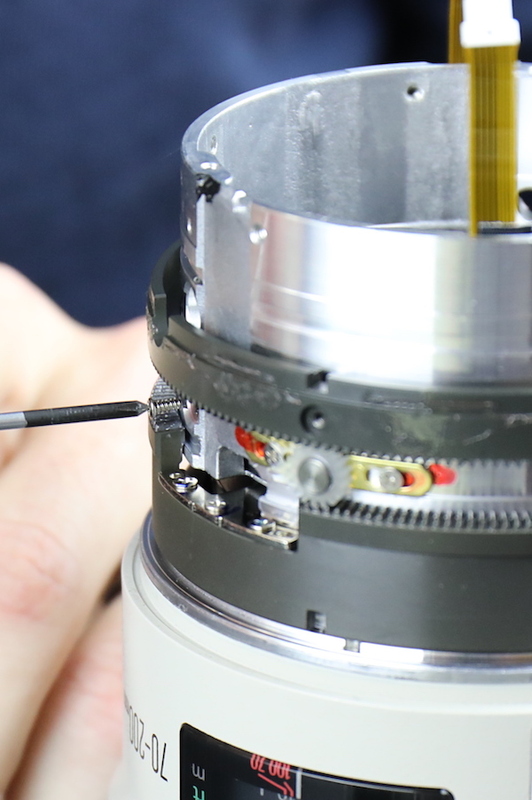 With the IS unit removed, we are looking down at a single optical element in the mid barrel. 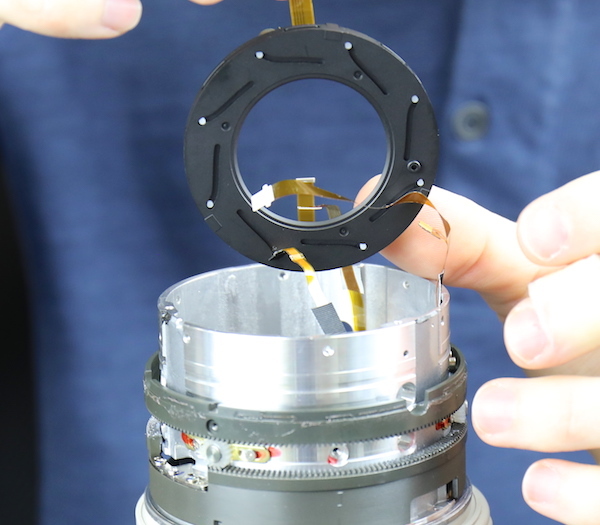 It’s just behind the aperture assembly; you can see the aperture motor peaking up through an opening at the bottom of this picture. 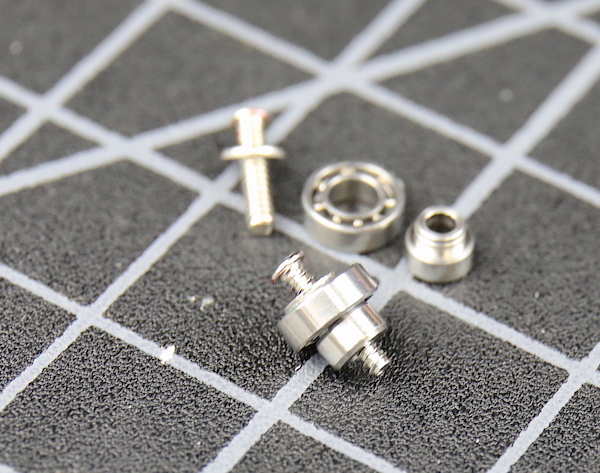 This element is adjustable for tilt, so both screw and black plastic eccentric collar have to be removed to take it out. Once these three assemblies are out, we can remove this element from the barrel. 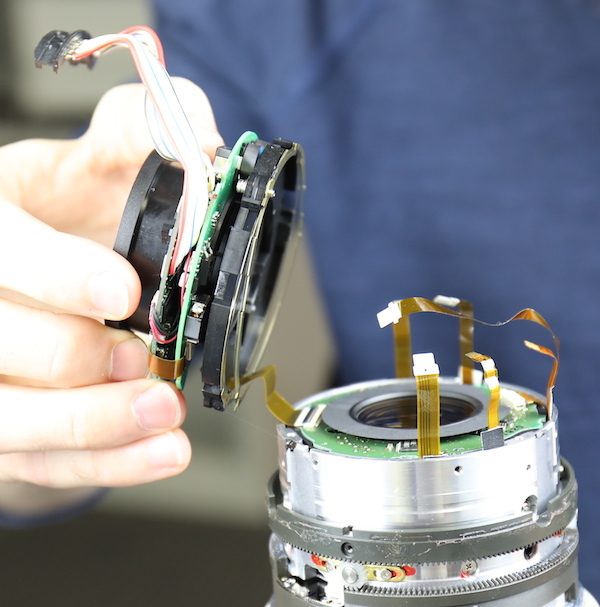 Now we have access to the aperture assembly. 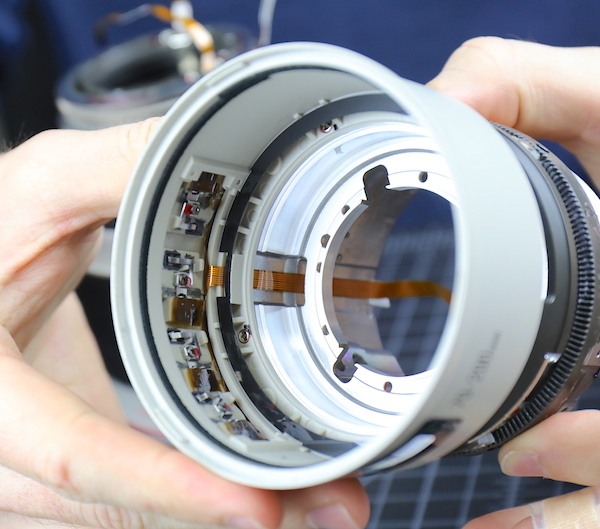 Removing three screws lets us take the aperture assembly out of the barrel. 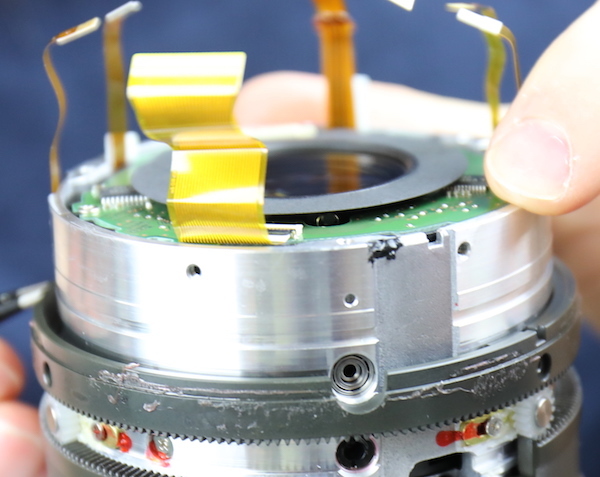 With the aperture assembly removed we can now see the eight screws that attach the rear barrel to the front. 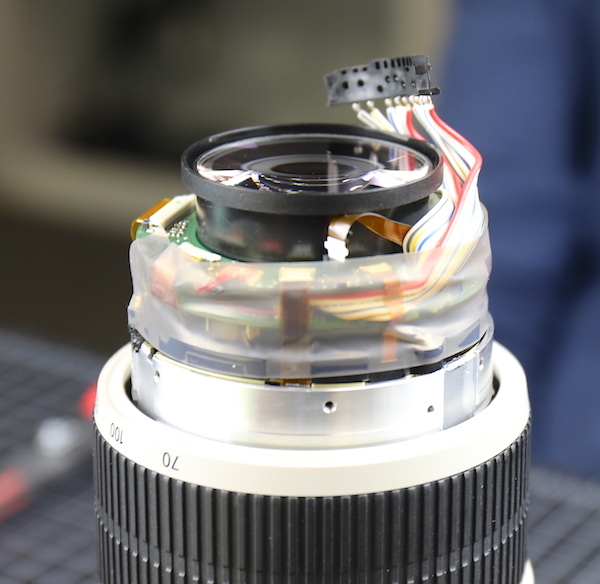 After removing those, we can slide the rear barrel off the remainder of the lens. That’s the AF motor you see under Aaron’s fingers. The rear barrel is empty now except for the switch panel. This could now be removed from the outside, but there’s no reason to do that. 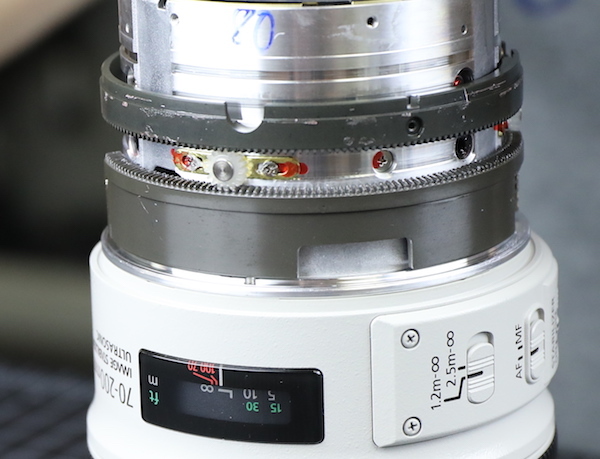 The remainder of the lens contains most of the glass elements and the AF motor. Of course, the rubber comes off first. 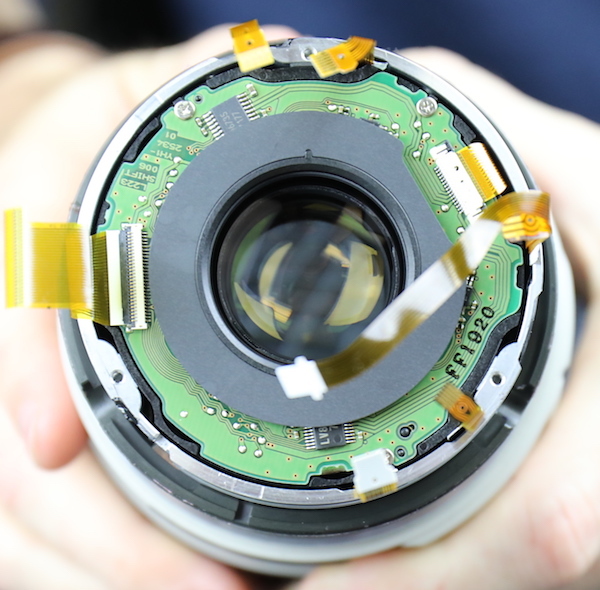 Underneath we find the only slot-head screws the lens has. It’s hard to tell from the image above, but the screw is holding down a nylon collar. These impart a smooth feel to the manual focus. 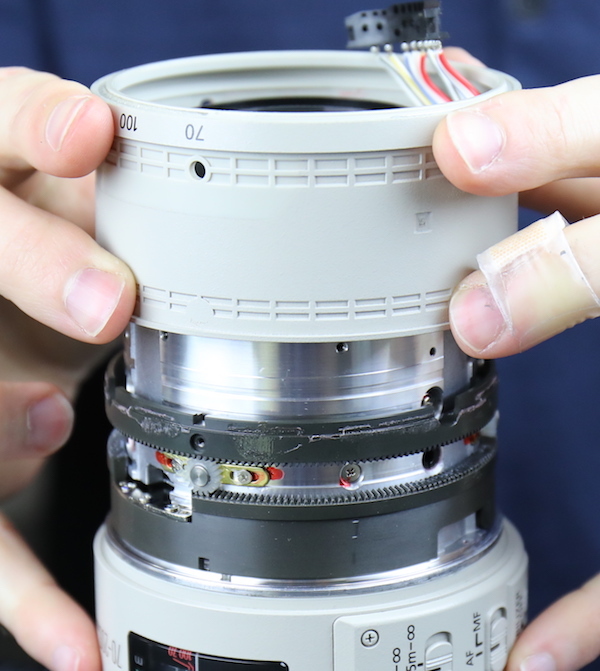 With those out, we can remove the focus ring. And now we can see the inner focusing barrel. The brass screw inset is where the nylon collar was, and you can see the slots and cams for the focusing group. There are two layers of weather resistance tape around the front group. 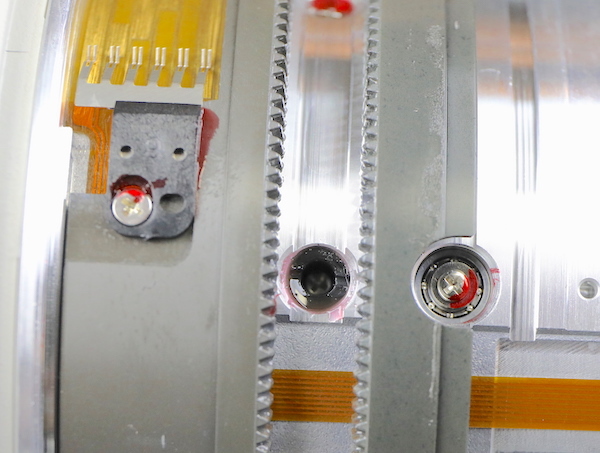 Now we’ve exposed the screws holding the front group assembly in place. This is a place we go a lot, whether to replace a scratched front element, clean out some dust, or make an optical adjustment. 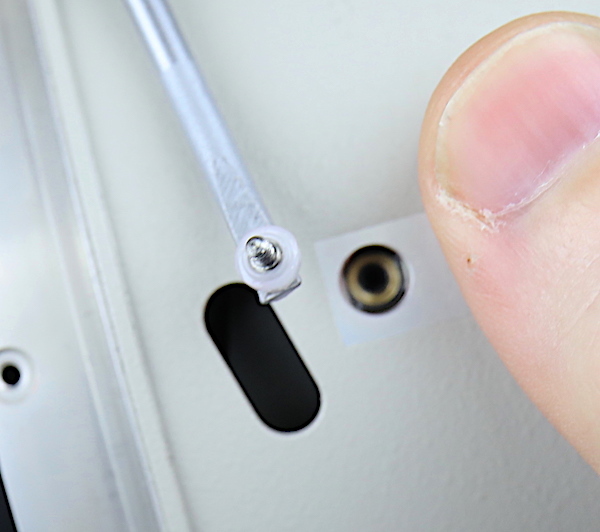 There are two sets of screws that adjust the group and hold it in place. The first set of three (only one shows in the picture) is set in a ramp. 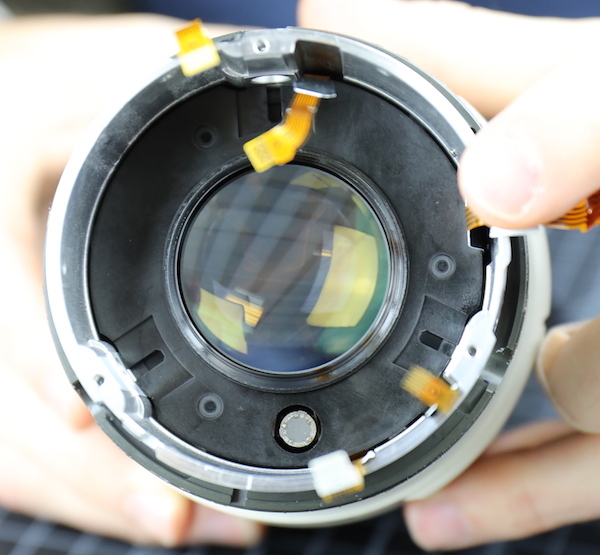 Loosening them and turning the front group adjusts the spacing between the front group and the rest of the lens. 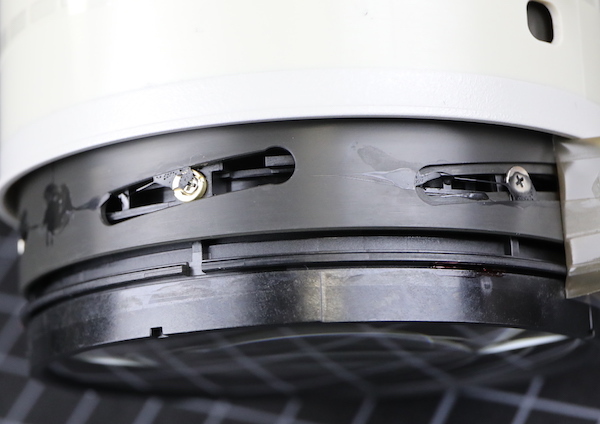 The second set is three eccentric collars (again, only one showing), used to adjust the tilt of the front group. There’s one more set of adjustment screws for the focusing group we can see down under the focus barrel. 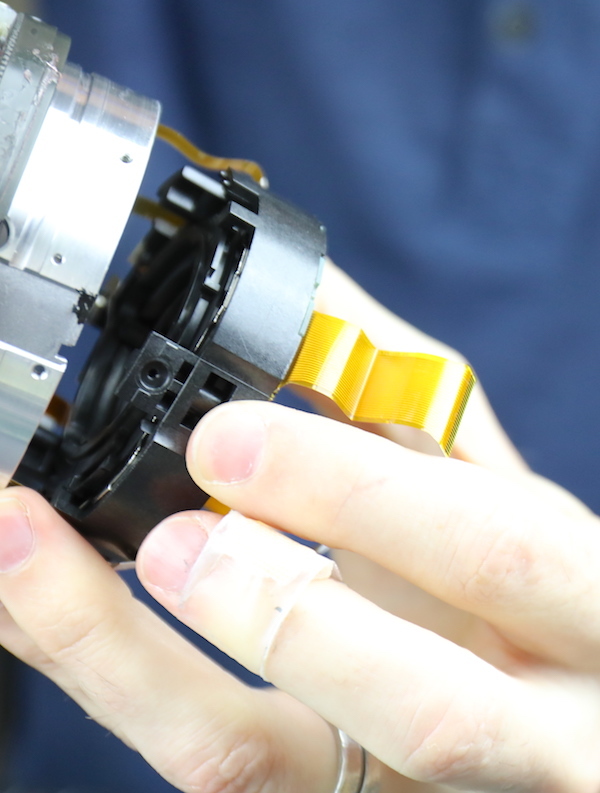 We didn’t see any reason to take the AF motor apart or remove the front group. 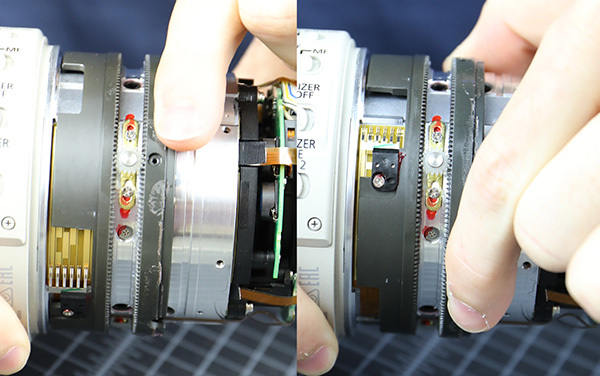 We can see everything there is to see except for a set of adjustment screws for the zoom group that are under the focusing motor. It’s certainly enough for comparison purposes. Optical spacing in front of the rear group. There is a different focusing barrel on the Mk III with the newer waffled pattern. I got a bit excited, but the Aaron told me he’d seen several recent vintage Mk IIs that also had the newer barrel. Again, all of the disassemblies of the front was exactly the same as with the Mk II, so I won’t bore you with details. 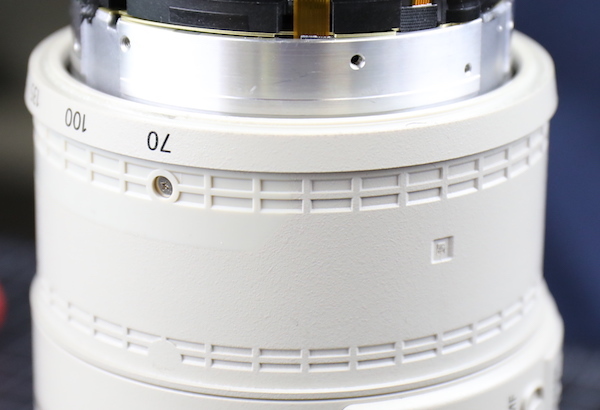 The optical adjustments of the front and focus groups were unchanged also. If you really like the new color do what we do for touchup paint: take the tripod ring from your friend’s Mk III to your local paint store and have them color match some enamel for you. 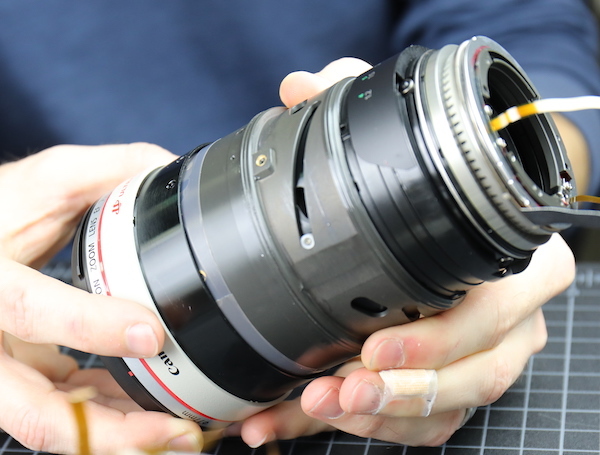 Canon claims the new fluorine coating makes it easier to wipe off oil and smudges. I think the new fluorine coating is easier to wipe off. Could be Canon and I are both right, could be just Canon is right. As to the Canon 70-200 f/2.8 Mk two-three, it’s still a really excellent lens. 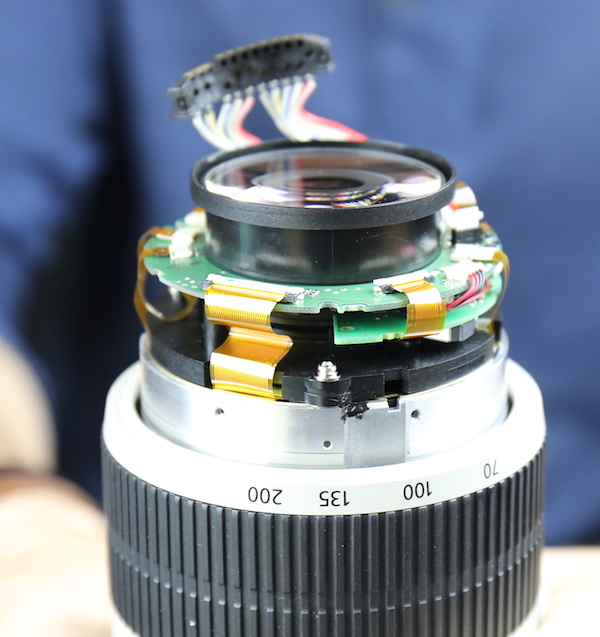 It’s not pretty or elegant inside, but then, neither are most other manufacturer’s lenses. It takes great images, that’s what matters. Unless you are a Geek from the engineering-can-be-art school. 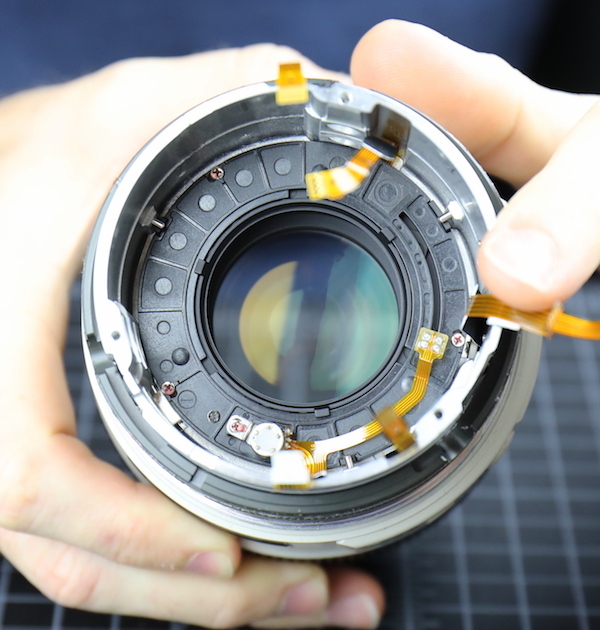 Does the camera itself have to be turned on when turning IS on the lens off in order to lock the IS mechanism? Some guys just don’t make sure to use a clean section of sidewalk. Wow, never knew that about locking IS for travel. Super great tip, Roger! 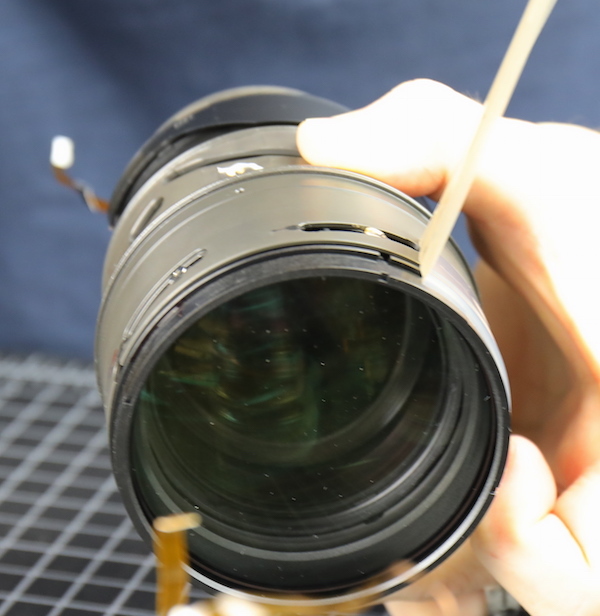 I always cleaned my lenses like that, for over 30 years, never had a scratch. And no, I don’t use “protective” filter either. Honestly no, I just skimmed. At least for Nikon 70-200/2.8G II, there is nothing the user can do to lock the VR group in place. 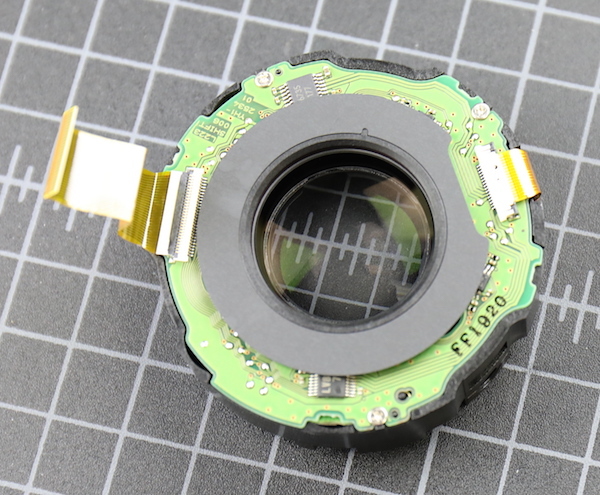 It will flop around when shaken if the body is removed from the lens. No matter how the switches are turned. However, in other Nikon lenses I have never managed to hear VR flop. Is it also true with Nikon lenses? You were lucky. Usually those guys clean lenses by scraping them along the sidewalk. In a market where annual model changes are not de rigeur there can only be some nebulous sort of determination as to when an accumulation of incremental changes and the passage of time require nomenclatural upgrade. That said, it is somehow comforting to know that my two-year old stabilized 70-200 f/2.8 Mark II L series lens hasn’t been rendered obsolete by the sort of un-imaginably phenomenal level of improvement which it was expected would underlay the Mark II to Mark III transition. 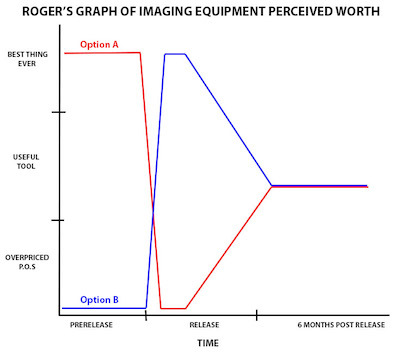 Roger’s Graph of Imaging Equipment Perceived Worth is admirably appropriate. 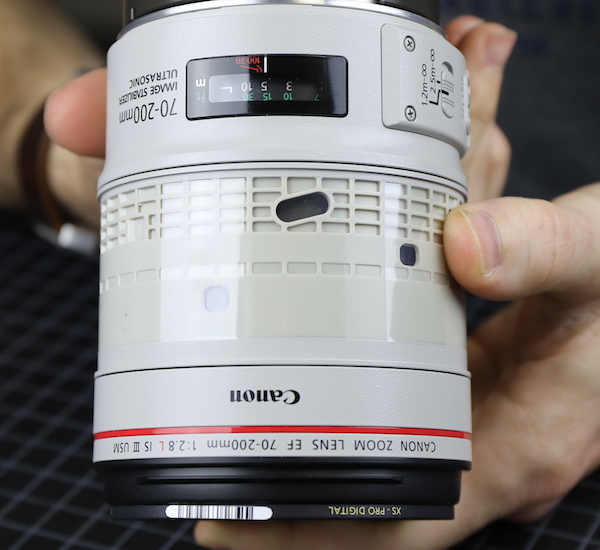 I wonder what a graph of perceived worth specific to Canon’s series of EF 50mm f/1.8 prime lenses would look like. Some sources suggest the thirty-year old EF 50mm f/1.8 first version of that lens has a street value that is approximately twice that of the later mark II and STM versions. I was just showing my newspaper-photographer friend my new Sony ARIII and 55 1.8 lens. First thing he did when I handed him the lens was look at it, breath on it, and clean it with his shirt. I was so upset as I have 20+ year old lenses and binoculars that I have kept so naturally clean from caps that I have literally never cleaned them. And when they are ready to clean, I don’t do it in the field ever. Good thing I had a filter on it. You evidently didn’t read the article. Thanks. The filters I prefer are the B+W MRC Nano clear ones, but of course they have a similar coating!??! 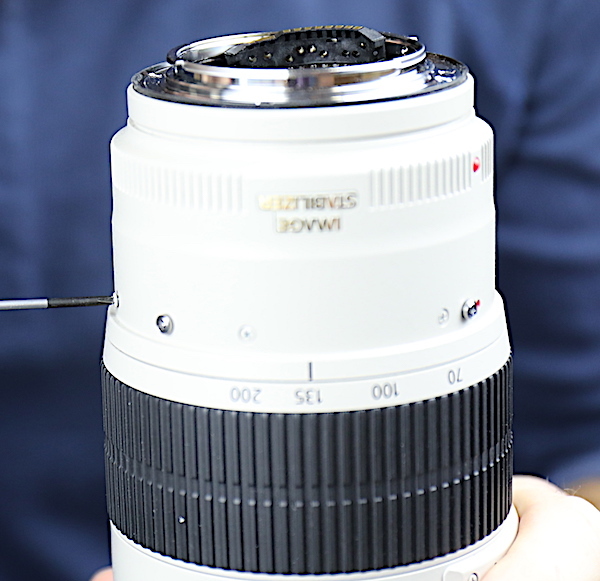 Oh and as the filter didn’t arrive and I’m off to photograph Peregrines with the 100-400 later – how do you spot coating damage over just a bit of a smear and how rough is okay? 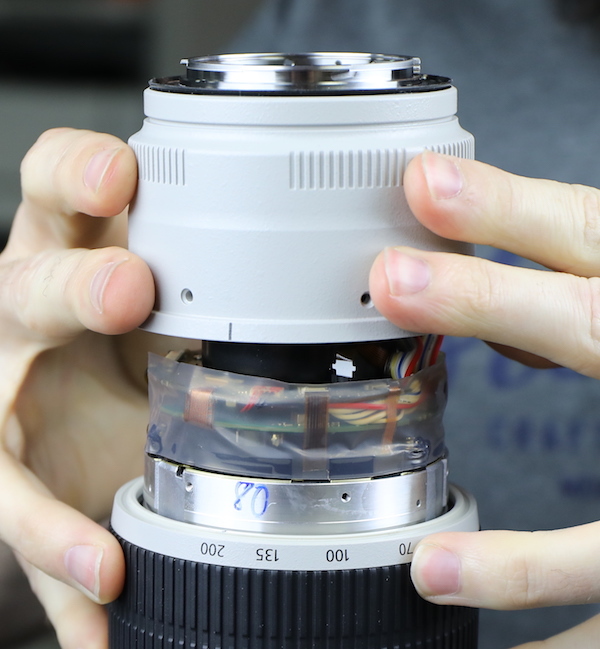 The proper thing to do is 1) Turn IS off at the lens while the lens is still mounted to a camera. This ‘locks’ the IS unit in place. 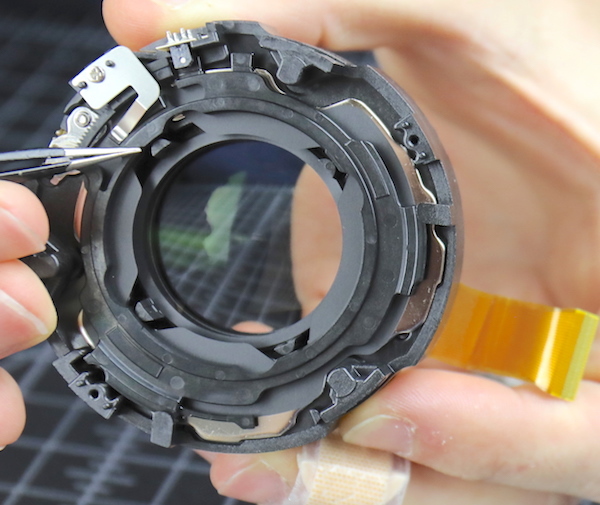 If you have IS on and just remove the lens from the camera, then it does not lock and off the camera flipping the switch does no good. 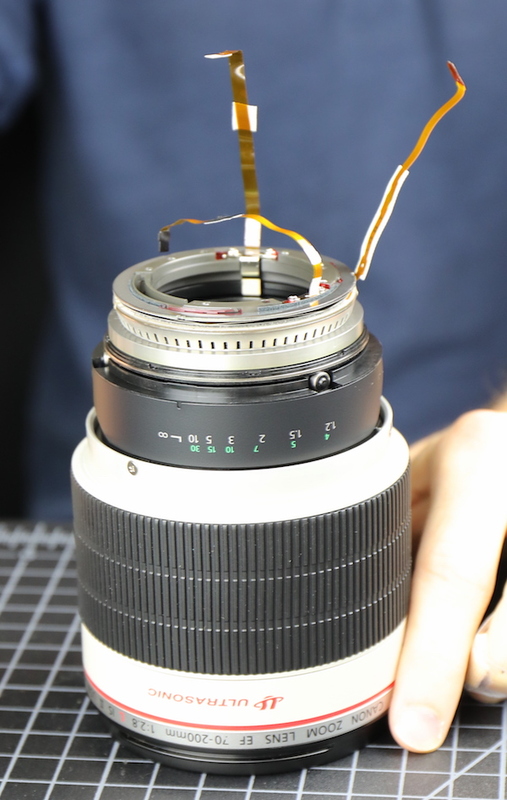 You can confirm by gently shacking the lens; there’s very little noise if the IS is locked. 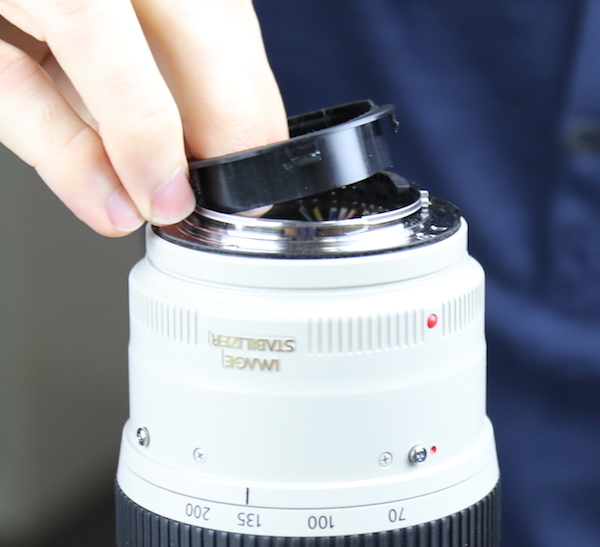 The locked position is safer for transporting the lens. If it’s not locked the IS unit can bounce around and cause damage. How big a deal is it? I can’t say for sure, but maybe 1 in 1,000 shipments that come back with IS not locked are damaged. But the incidence is 0 in 1,000; or very close to that, with IS locked. Roger, can you please explain the point about the IS unit possibly being damaged in transport if IS is turned OFF? 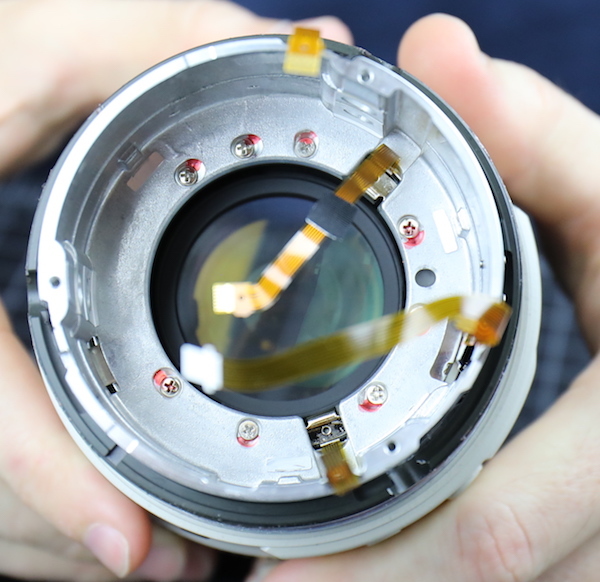 Should we keep the IS in the ON position when we transport these lenses? Thanks for a great read Roger. When you see what goes into them suddenly they are look like excellent value. The 24-70 f/2.8 II is by far the worst, 100-400 IIs were frequent flyers too. We went with B&W clear filters. 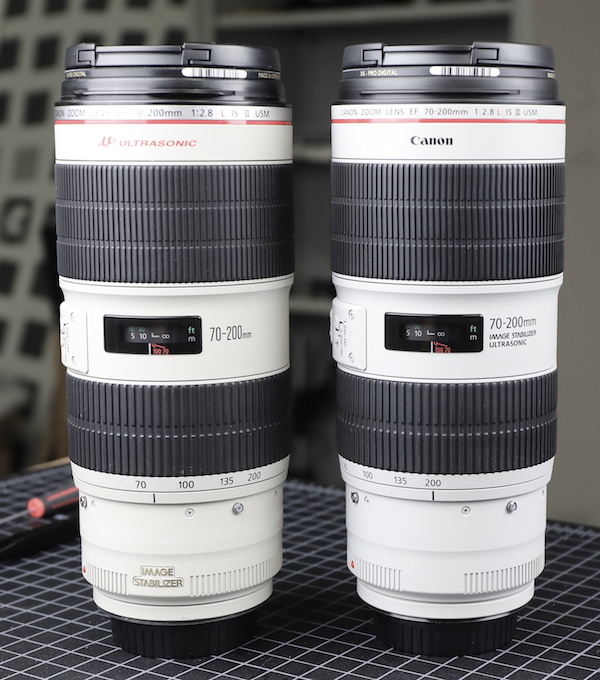 Also which filters did you choose for the 70-200s? I had the mk2 when it first came out it was super sharp at 2.8 but the i.s failed to lock between 70 and 100mm it would just wiggle non stop but useable above 100mm, strange. Got a second copy but nowhere near as sharp as the first one and this was supposed to be a pro grade lens? Sold it for thr 100-400mm mk2 L.
From Nikon’s term glossary “…Thanks to Nikon’s original technology, it delivers higher durability and is more peel-resistant. Compared to other manufacturers’ coating of a similar kind, fluorine coat endures a higher frequency of lens surface wiping and provides longer-duration staying power…” Would you tend to agree with this? Also, tres shade Nikon. Well played. ? To be fair, it is exactly what they said it is. Wow. Just wow. Seems a bit disingenuous on Canon’s part. Add a coating and Mark III it is. According to Canon fluorine coating makes it much easier to clean the front and rear elements, so dirt and oil can be easily wiped away. 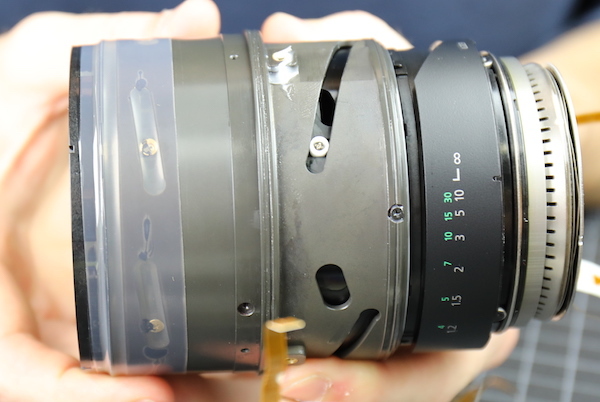 With at least some of the lenses Canon has released with this coating, our opinion is the coating is very fragile. 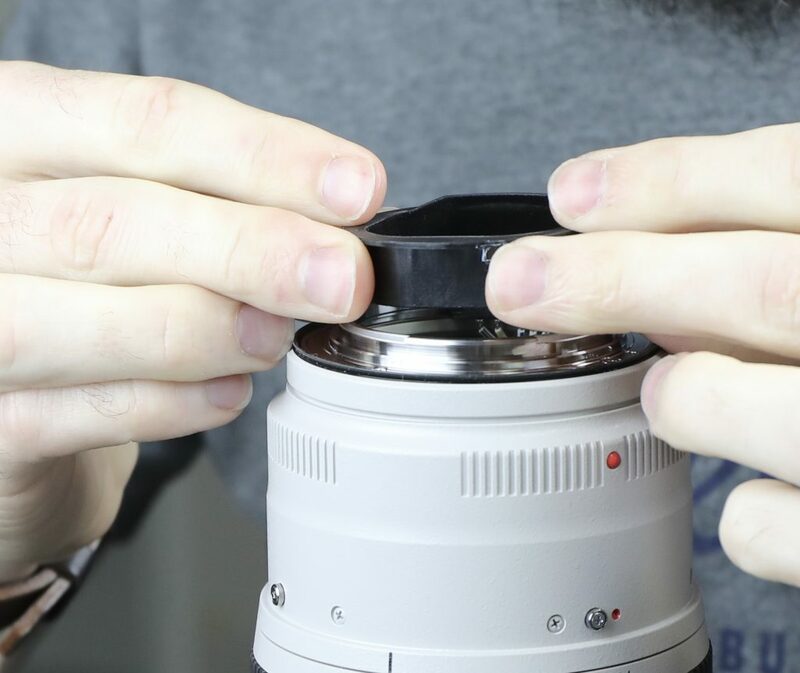 We started putting filters on all of our lenses a year after Canon started putting fluorine coating on their front elements; the incidence of lenses needing front element replacements for coating scratches and peeling skyrocketed. Canon says it’s not so, so perhaps it’s just us. what does your comment about the fluorine coating mean? isnt it effective? Thank you for publishing this, I find it very interesting.